Saavn releases Windows 10 universal app. Saavn, India's leading music streaming app, today announced the launch of Saavn for Windows 10. Saavn for Windows is launching as a Universal Windows App (UWA) with an adaptable layout for desktop and tablet. The mobile app will be available when Windows 10 is available on mobile later in the year. 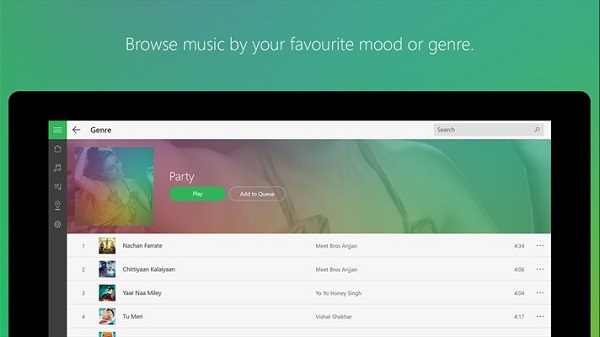 A demo of the Saavn for Windows app was presented to attendees at the Windows 10 launch event in Delhi on July 29th. Starting today the Saavn for Windows app will be made available to the public. Saavn gives you unlimited, free access to all your favourite Bollywood, English, Hindi, and Indian regional music. Windows 10 users will now have access to Saavn's music streaming experience and catalog of more than 10 million tracks across 11 languages. Music listeners on Windows can now enjoy Saavn's core products and features, including phonetic search, dynamic bit-rate streaming, and industry-leading design. In addition to an adaptive layout, the Saavn app has been optimized for the Windows dynamic landing page - allowing users to pin the Saavn app onto their Start screen - giving them quick access to their favorite music. The Saavn app also comes equipped with the Windows live tile functionality. Once in the app, the Saavn home screen and core features are aligned with those of Android and iOS. Additional features will be launched in the coming months, including Saavn Social features (Tag, Chat, Follow and Share), Saavn Radio, and Saavn Pro, for online and offline listening.